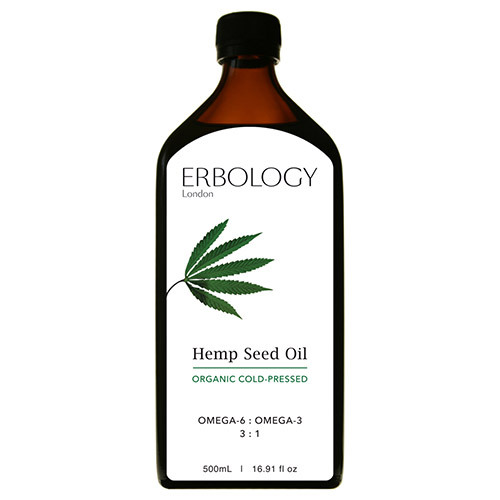 Erbology hemp seed oil is a strong antioxidant and nutritional powerhouse with an excellent 3:1 ratio of omega-6 to omega-3, beneficial for a healthy heart and brain. You can use it internally, as well as topically by applying on your skin and hair. It is thought to help increase skin elasticity and water retention capacity in tissues. Omega-3 fatty acids have a positive effect on the health of hair follicle and scalp, leaving your hair look stronger and shinier. Erbology want to bring nature`s most powerful superfoods in their purest forms into the everyday, busy lives of health-conscious cosmopolites. Their superfoods are made from hand-picked, organically grown plants that have the power to de-stress, balance, and revitalise your body and soul. 100% organic cold-pressed oil made from hemp seeds. As a dietary supplement, one tablespoon per day. Add to smoothie, porridge, dressing or yogurt. Store in a cool, dark place below 25°C. Not intended as a substitute for a varied diet. 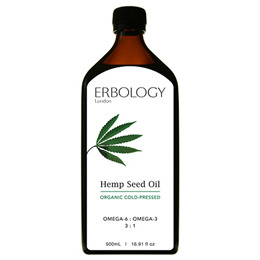 Below are reviews of Erbology Organic Cold-Pressed Hemp Seed Oil - 500ml by bodykind customers. If you have tried this product we'd love to hear what you think so please leave a review. It's a great product and fantastic value for money. We use it in all different ways - applying it on my skin, applying it on my baby's hair/scalp, taking it with food. It has a light green colour and a subtle herby scent. It's not too oily / greasy on application which makes it a perfect moisturiser. However, too much will stain your clothes so little goes a long way.